Being able to stay focused when we’re faced with such a plethora of online content and engagement options is virtually impossible. You all know what I’m talking about. The amount of stuff we have open on the desktop at any given point in time, all begging for and sucking our attention, is crazy (browser, IM services, documents, presentations, command line, itunes, …). And don’t even get me started on tabitis. And that’s only your laptop I’m talking about. Your smartphone is “harmlessly” lying just next to it, constantly pushing you with new info about where your friends are, who just emailed you, replied to a message or commented on something you posted. Crazy. I keep saying distractions make me concentrate and it’s the only way I can work. Yeah, right… Who am I kidding? No one, including myself. 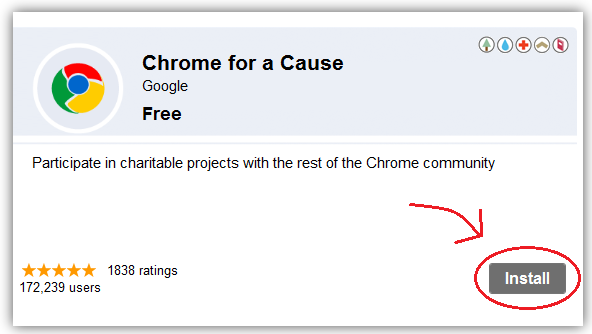 Enter Chrome for a Cause. Like every good story, this one starts with a Chrome extension J. Chrome for a Cause is an extension Google released for the holiday season, that lets users donate their tabs for charity. For each tab you opened, Google contributed money to a charitable cause of your choice. The Chrome for a Cause campaign operated for a mere 5 days, but it took way less than that for it to seriously affect my surfing behavior. Soon after installing the app, I noticed I was becoming so obsessed about my tab count going up, that I actually started closing each tab I finished reading in order to open more tabs and donate more money. Till then what I used to do was simply google the next thing I was looking for from the address bar of the same tab I was on. 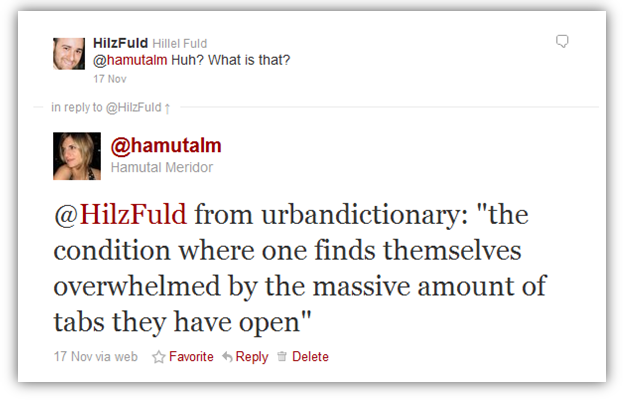 Now I found myself closing old tabs and opening new ones for my next endeavour. The tab closing behavior became so engraved in my brain that I keep on doing it today, a few weeks later. Yes. It’s that easy to change behavior. I mean, seriously! A couple of days of tab counting and I was hooked (Or… it may just be the brilliant product designers at Chrome that made my tab closing so damn sticky). So instead of trying to feel good about the crazy competitive gamer within me, I decided to focus on what good can come out of it. If it’s so easy to change surfing behavior, why not use the same mechanisms to drive a positive change. And one of the most burning problems to tackle would be online attention. Instead of rewarding users for opening tabs, let’s reward them for keeping their focus. Not checking their facebook / twitter accounts every half hour. Not keeping a million tabs open and never going back to them. And if we integrate that into a tasks app, then we can even track people for their progress and award them for that too. And online focus is a small problem. What about bigger ones? I’ve recently been reading Clay Shirky’s Cognitive Surplus which opened my mind to the incredible possibilities the human kind has in the connected age we live in. If we correctly use gaming mechanics to seamlessly integrate value production into everyday surfing in a fun, simple, way, we could well be building the next Wikipedia with a simple click. As any freelance, self-employed, or anyone working from home knows, managing your time and getting things done in general doesn’t always come easily. Especially not to people like me who always do everything at the last minute. Mind you, I usually spend 20% of the time others do and get the job done, at least as good as them. Working under pressure gets the best out of me. The clearest evidence for this must have been my master’s thesis. I was writing it in August 2006, in Edinburgh. And Edinburgh in August is festival time. The city is filled with artists, actors, dancers, street performers, parties, and the biggest festival crowd in Europe. It’s total mayhem, but in a good way. August 2006 was the last month before my thesis submission. My classmates were all past a couple of months of hard work whereas I was way behind in my writing. In fact, I believe at that point I haven’t even started the actual writing. BUT it was festival time. I couldn’t sit and work all day in the labs when I knew what was going on outside. So – I decided each day I’m going to do something festive. Thanks to a few friends I got a bunch of free tickets and party invites (student budget, after all). And every single day I would go out to see a play, dance, walk around, see street performers and meet people from around the world. Live and breathe the festival. My friends thought I was crazy. How can you hang out when the dissertation is due in a few weeks?! well, I couldn’t not. I soon realised these breaks were the fuel that drove my work during the day. Sure, I could bum around the labs all day, OR I could work a few intensive hours knowing that I get to go out for a couple of hours and enjoy. I don’t think I was faster than my classmates, I believe I was making better use of my time, working harder while I was working, and partying as a reward. A while ago I got to see an amazing amazing talk by Amy Jo Kim called Putting the Fun in Functional. Kim discusses how using gaming mechanics can help build better software. It’s quite an ingenious concept. Gaming mechanics are the rules behind the design of a game that allow the players to have a fun and engaging experience. Though this was the first time I’ve ever heard of gaming mechanics, I have actually been unknowingly obsessed by the field for the past year or so. As an avid user of location based app foursquare (and one of the first Israeli users), I was amazed at how seamlessly they use simple (or as I called them “begrush” = cheap) psychological elements to make their game a hooking one. Using points, badges, titles and more in a resourceful way, they’ve made their application entirely addictive (at least for a while, but that’s another story). So when I bumped into Kim’s talk, I knew I had to dig deeper and learn more about it. So I did. I read about Zynga’s methods and legendary playbook, SCVNGR’s gaming mechanics playdeck and more. And then it hit me – I use this stuff daily. Quests – these are the building blocks many games use to give people specific tasks to go after once they enter the game. It’s a “goal interface” design, if you will. In real life, it’s simply your to do list. Each bullet is a well defined quest to complete a task. Countdown dynamic – players are only given a certain amount of time to complete a task. This dynamic is for people (yours truly included) who work best when they have a deadline. Problem is that as opposed to games where you have timers, in real life promising yourself you’ll finish something by a certain hour won’t work as well. What I’ve discovered works best for me is linking the deadline to an external factor. So I’ll tell my partner, my designer, or even a potential investor I’ll have something ready for them by tomorrow. And it works. This may sound a bit crazy – holding promises to others drives me more than promises to myself. But truth is that’s one of the biggest concepts in gaming dynamics – the power of the community. People are driven to work harder when they have competition, when they can show off what they’ve done, when they get feedback. So why not embrace it and let it help me in real life? Achievement dynamic – get a reward for achieving something. In our case – give yourself a reward for achieving the quests you set out for yourself. The crucial thing here in my opinion is to set the reward in advance. If I tell myself I’ll get to go see a movie when I finish writing a document, I’ll finish writing that document in time to catch the movie. Of course you can’t go to a movie every time you finish something. Simply taking a break also works. Try saving the big rewards for bigger quests, or for a few consecutive ones (this is actually a separate dynamic, “chain schedules”). Also, try to set the rewards not only according to the quests, but also according to your own mental state. I, for one, know that I hate working in the afternoons. Mornings and evenings are my time. So I might schedule a reward in the form of afternoon coffee with a friend to bypass that. There are quite a few more, but the main thing here is to acknowledge we all need some help. And as Woody (or Larry) say – Whatever Works. As an end note, examining the difference between gaming and real life I notice how many of these dynamics involve a community. From leaderboards to feedback, the community is often what gets us going in a game. Just imagine where we’d get if we could build a game-like community around our work tasks, or our life in general. Gamify life!